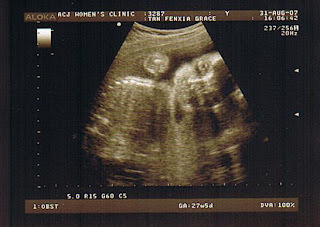 I thought i would bother to update everytime after my gynae's visit..cos that's when i have the ultrasound scan. whell..not so much the other time around. 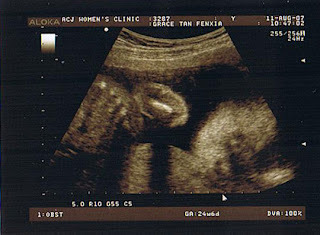 we knew that baby Eliza is abt 680g @ 24weeks. and she was facing down again so we couldn't really see her face. 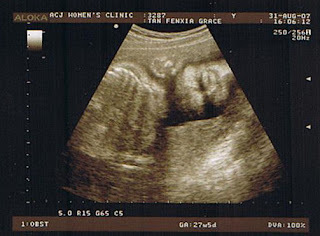 but we were able to hear her heartbeat really loud! - climbing stairs...i see it as exercise but gosh i get out of breath more easily than normal...must be the extra weight i put on! - reading - i've been like reading as much as i can..magazines, pregnancy books, baby books and still it's never enough and i feel like i don't really know until i experienced it. I wrote those about a week earlier but for some reason, my comp hung and i was to lazy to start it up again so i'm starting some writing again. Today we went for gynae check up and Eliza has almost doubled in weight since we last saw her thru the ultrascan. we had such a hard time seeing her coz her head was facing down again..but this week we did see her..moving her arms and legs, turning her head a bit. and now she weighs 1.1kg! and me....i gained 1.8kg since my last gynae visit which was 3 weeks ago! gosh...even though Eliza's weight gain is 1/3 of my weight gain. hoho...no wonder i'm feelin heavier lately. Now's the time to start preparing for baby things, cot and all sorts. so we went to the Taka sale and bought...mainly clothes. my sis-in-law says she has lots of milk bottles, then we have a sterilizer at home already...till in the end i juz bought baby wipes and clothes. Ww picked this one out which is really cute! and who can resist such sweet socks!! 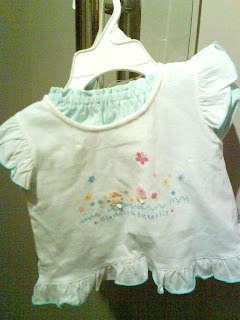 the thing about having girls is the beautiful and sweet clothes for girls. ...not counting some that friends have given also...stored in a box which i'm too lazy to pull it out until one fine day we have the energy and time to go buy a cabinet for Eliza's things. there are much i would love to write but i'm sleepy at 9pm....yawns...maybe because i missed my sunday afternoon nap. i think i'm going to sleep more over this weekend. meanwhile i hope i can stay awake and wait till Ww comes back to show me his Teacher's day gifts.